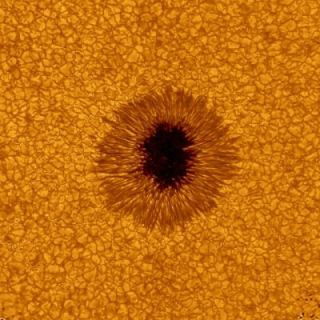 Images taken July 1 and 2, 2010 by the New Solar Telescope at the Big Bear Solar Observatory reveals up-close details of a sunspot like never before. Full Story. Sunspots are darker, cooler areas on the surface of the sun in a region called the photosphere. The photosphere has a temperature of 5,800 degrees Kelvin. Sunspots have temperatures of about 3,800 degrees K. They look dark only in comparison with the brighter and hotter regions of the photosphere around them. Sunspots can be very large, up to 50,000 kilometers in diameter. They are caused by interactions with the Sun's magnetic field which are not fully understood. But a sunspot is somewhat like the cap on a soda bottle: shake it up, and you can generate a big eruption. Sunspots occur over regions of intense magnetic activity, and when that energy is released, solar flares and big storms called coronal mass ejections erupt from sunspots.